In our last review, we looked at the much-overlooked Chandra, who was given her second deck in Expasnion Pack 2. Although Chandra’s story could be summed up as “always the bridesmaid, but never the bride,” we ended by noting that big things lay in store for her with Magic 2014. In both the Core Set release as well as the Duels of the Planeswalker tie-in, she’s been given center stage, a starring role beneath the limelight. The character of today’s focus might simply wonder what all the fuss is about. After all, didn’t the series hit its highest note last year? It certainly might seem that way from where Nicol Bolas perches. We covered his extensive history in our look at his entry in the Duel Decks pantheon, rising from merely being one of several (Elder Dragons), into being the quintessential Magic “big bad,” right up there with the Phyrexians. But they are many, one easily imagines him sneering, my accomplishments are mine alone. At the time of that writing we could not have foreseen it, but those accomplishments would soon grow to becoming the iconic figure, the “face” of Magic 2013. 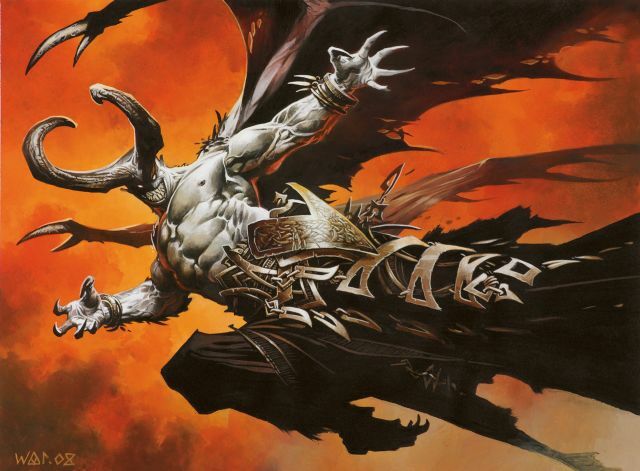 With his stylised horns-and-gems silhouette emblazoned on merchandise, and a number of new tribute cards contained within (such as Gem of Becoming and Disciple of Bolas), the imprint of Bolas was unmistakable. For Duels of the Planeswalkers, the ancient Dragon planeswalker served as the primary antagonist in the first Expansion Pack, but with the second he becomes a playable option with Eons of Evil. The deck starts, humbly enough, with a trio of Plague Beetles. 1/1’s with swampwalk, these Insects from Urza’s Legacy are rather hit-or-miss affairs. Against a fellow Black mage, they’ll put up a nice stream of steady damage, but otherwise they’re little different from a Merfolk of the Pearl Trident. The deck, notably, is absent any two-drops, meaning that only the Beetles are there for an early-game presence. Clearly, this is a deck built to go the distance. Moving to the three-drops, we find a full playset of Grixis Battlemages. While in the world of constructed a four-of card is often the default for the sake of consistency, the relative scarcity of such commitment in the preconstructed world tips off the importance of a particular card in a deck. Clearly Eons of Evil wants to give you access to filtering and faltering, to use the colloquial terms for both of these effects. The filtering in particular is useful, not just to improve draw quality but also to give you a conduit to get fatties into the yard for reanimation. A similar emphasis goes for the Merchant of Secrets, a card from Legions that also gets the full inclusion here. Unlike the Battlemages, though, the Merchants are more of a raw resource rather than a utility card. Because they replace themselves in your hand when you play them, they’re perfect fodder for some of the deck’s sacrifice-driven creatures. Finally, there’s a trio of Hidden Horrors. Originally from Weatherlight, these have seen reprinting as recently as Premium Deck Series: Graveborn. Given the deck’s minor reanimation subtheme, these are a very reliable way to see your reanimation targets safely into the graveyard where they belong. We neat the top of the deck’s mana curve with the Blazing Specter, the deck’s only four-drop. Thanks to haste and flying, the Specter can often get in for at least one strike, forcing your opponent to discard a card from hand. If they lack removal or aerial defenses, the card can then wear away at their hand turn after turn until they solve it. One of the deck’s nine rares (including one mythic rare), Eons of Evil is a worthy testament to Nicol Bolas. Unlike Mind of Void from the first Expansion Pack, the rares in the deck aren’t drawn because they happen to be the cards needed to sustain a niche strategy. As we’ll see, these are a collection of Big Bads, beaters that will make most any opponent tremble with fear should you land one. It’s important to note that there are two different ways to get these closers into play. The first way is to simply hardcast them, for unlike the aforementioned Graveborn there are no off-colour cards here. Everything is castable purely through the basic land provided, so long as you survive long enough to grow your manabase. The other way is to cheat it out with the Zombifies the deck packs. An optimal line of play would see you play a Hidden Horror on turn 3, discarding something fat and nasty, only to return it to play next turn with a Zombify. With only three of them in the list, though, it’s not a plan you can count on seeing every game. The first set of beaters all clock in at six mana. Shards of Alara gives us the Flameblast Dragon, a hefty 5/5 flier which offers you a free Blaze every turn. The Deathbringer Thoctar from Alara Reborn gives us a smaller body for the cost, but with the prospect of permanent growth. In addition, removing +1/+1 counters can send pings of damage anywhere on the table, just the ticket for helping to close down a mortally wounded opponent. Finally, the Xathrid Demon is the first mythic rare card we’ve found thus far in the Duels of the Planeswalker decks. A massive evasive beater, the Demon can end a game in three or less turns all by itself. That said, it does exact a terrible cost in lives to keep it satisfied, though unlike some of its predecessors (see: Lord of the Pit), you do get some value out of the sacrificial offering beyond just keeping your infernal minion happy. Cut from similar cloth is our next closer, the Archdemon of Unx. Slightly smaller and more expensive (though less mana-intensive), the Archdemon retains both the evasion and trample that makes the Xathrid Demon so vulgar in the red zone. Instead of loss of life for your opponent, though, the Archdemon converts one of your creatures into a 2/2 Zombie token. Although there are a few exceptions (Plague Beetle, Merchant of Secrets), for the most part this is a demotion for your creatures. That said, if you’re attacking in with this thing each turn, you won’t have to deal with the Zombie transformation issue for long. Next up is a simple flier, Worldwake’s Goliath Sphinx. Although it doesn’t offer any of the bells and whistles some of the other cards in this price range do, it makes up for it in part by being the single biggest creature in the deck. Finally, there’s a Hamletback Goliath. Although it starts “small” as a 6/6 for seven mana, it quickly can grow quite a bit bigger with each successive summoning as its pile of +1/+1 counters grows. Any of these are must-answer threats for your opponent that can bring the game to a quick and decisive end. The noncreature support suite of Eons of Evil sees simplicity and focus as virtues, eschewing variety and complication for sheer efficacy. The aforementioned trio of Zombifies is pivotal to the deck’s aim of reanimating something fat and nasty out of the graveyard, in addition to giving you a second lease on life for any of your beaters that has met an early end. 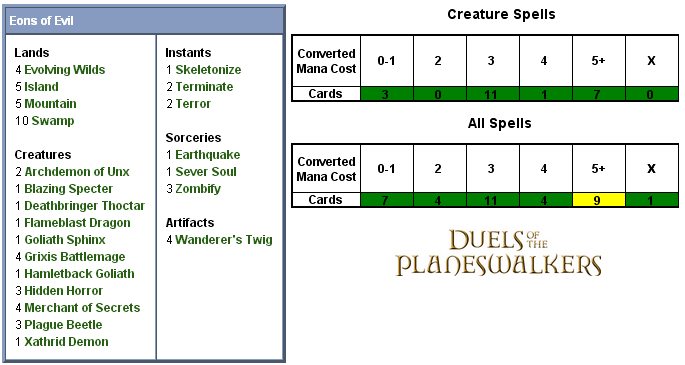 You also get a full playset of Wanderer’s Twigs, to help develop the deck’s manabase. In the odd three-colour deck, this goes a long way. The rest of the deck is given over to removal, and rightly so. For all that you’ll be looking to play some of the nastier denizens of the multiverse, you still need to make sure that your opponent’s board is clear of obstruction. Eons of Evil gives you plenty of ways to do just that. At the most basic, you get a pair of Terrors, cheap instant-speed removal from the very dawn of the game. For a less conditional kill effect, though, swap that for a and you end up with Terminate. Solid removal from Alara Reborn, this can full-stop kill most anything that doesn’t have shroud, hexproof, or protection from Black or Red. Finally, there’s a Sever Soul. A card from the recently-reviewed Mercadian Masques, this kills any non-Black creature, and gives you a dollop of life equal to its toughness. Worth the extra mana? Debatable, but a little extra lethality is always welcome. Not to be outdone, Red contributes some some removal as well. Like many of the decks’ cards, Skeletonize hails from Shards of Alara block. A mix between a Lightning Bolt and Drudge Skeletons, it can easily offer a two-for-one effect. Finally, one more rare appears here in the form of an Earthquake. Another card originally printed from Alpha, Earthquake throws out a ton of damage- both to creatures as well as all players. It’s conditional in the fact that it hits your life total as well, so there will be times that you cannot in good conscience cast it, but drawn early enough you can bait your opponent into over-committing and blow them out with a massive wipe. To help with mana fixing, the deck contains a full playset of Evolving Wilds. We’ll give the deck a proper stress test, then return to render a final verdict. See you in two days’ time!